It’s an option that is nearly always more effective than either doing nothing or attempting to contain an outbreak through quarantine. Under normal circumstances, the most effective way to prevent illness is to vaccinate according to national immunisation schedules. Widespread immunisation programmes in Europe have made previously deadly diseases such as smallpox and polio a thing of the past. This study looked specifically at epidemic outbreaks. They found that in such cases targeting carefully selected individuals with vaccination can be successful in containing the outbreak, even with only a relatively small number of individuals getting the relevant shot. The scientists ran physics-based simulations on networks which sought to replicate the way individuals interact with one another in the real world, such as through the global air transportation network. The simulations are simplified versions of computational frameworks commonly used to investigate the global spread of real-world epidemics, such as Severe Acute Respiratory Syndrome (SARS). Nevertheless, they help understanding basic features of the more complicated and realistic models. In the simulations, individuals correspond to ‘nodes’ that can transmit an infection through the links between them. The scientists found that quarantining nodes after the outbreak of an epidemic very quickly becomes ineffective. Quite early on in a simulated outbreak, even the ‘do nothing’ (non-intervention) strategy becomes preferable to quarantine. 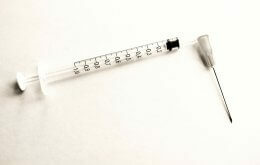 Targeted vaccination was found to be the best option in nearly all epidemic cases. The scientists used a vaccination strategy based on ‘optimal percolation’, which consists of finding the least set of nodes that, when removed from a network, can fragment it into small clusters. The idea behind this approach is that fragmenting the network ensures infections are contained within small groups, hence preventing the occurrence of large outbreaks. This might all seem like common sense, but preventive vaccination is not common practice for all illnesses and for some, vaccines do not yet exist. The norovirus outbreak at this year’s Winter Olympic Games is an example where quarantine has been used as the option available to health officials. Medical professionals have attempted to initially contain the outbreak by imposing quarantine on the hundreds of staff who were unlucky enough to catch the virus. Despite these measures, the illness is continuing to spread and has started to affect some of the athletes. In recent years, physicists have made significant advances in the field of network immunisation, developing increasingly efficient techniques to immunise a network by the ‘removal’ (vaccination) of a few nodes. This knowledge can help to support health policy as policymakers look to ensure increased global security against epidemics.